Andru: K, I’ll be up in a minute. Andru: Dinner isn’t over till we go to sleep. 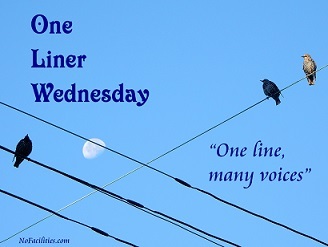 This not so One-liner Wednesday is brought to us by Linda G. Hill. Go check it out! You won’t regret it. Lol that’s boys for you ! That boy is a jewel. Does he keep you on your toes? No, not really. He just makes me laugh a lot!